Is the Route Verte a bicycle trail? A large part of the Route Verte, and the portion that is the most widely acclaimed, is a multipurpose trail built on reclaimed rail lines. Existing regulations stipulate that the trail is also open to other non-motorized users (skateboarders, inline skaters, kick scooters, etc.). 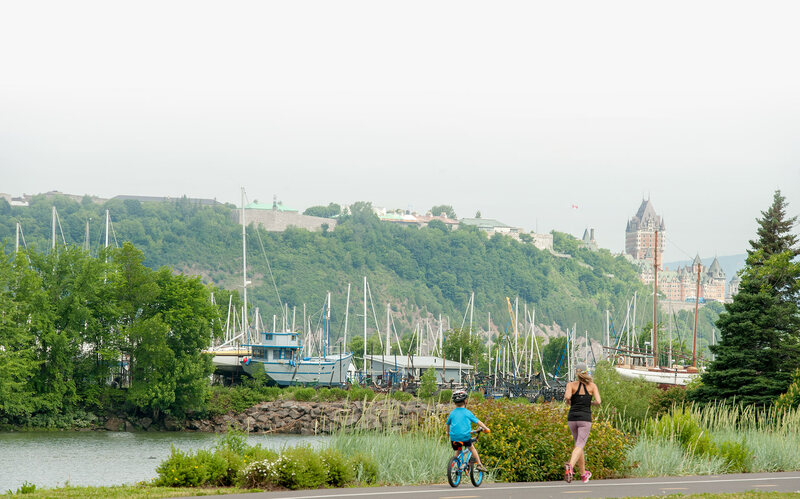 The bicycle paths along the Route Verte are physically separated from other types of traffic for optimal comfort and safety. They can be on- or off-road or sidewalk-level. On secondary roads where vehicular traffic is light, the Route Verte tends to take the form of a designated shared roadway. In areas where there are more cars, cyclists are directed toward the paved shoulders of regional roads or marked bike lines in city streets. For technical information on the various types of cycling facilities, click here. Note that the law requires children under 12 to be accompanied by an adult where the posted speed limit exceeds 50 km/h. How can I report a problem with the Route Verte? It’s easy! Use our interactive map to pinpoint the location of the problem and fill out the online form. The relevant details will be forwarded to the proper authorities for follow-up. Do I need a special type of bicycle to travel on the Route Verte? Not necessarily, although we do strongly recommend making sure you have a bicycle that is adapted to your individual physique and profile. Click here for help in selecting the right bicycle for you. Note that some legs of the Route Verte are easier to ride with a hybrid or mountain bike. Please check the interactive map and read up on the type of terrain and infrastructure before setting out in order to avoid any unpleasant surprises. Are there any sections of the Route Verte that are more challenging than others? Generally speaking, most of the network ranks as easy to moderate. However, given the variations in geography from one region of the province to the next, some sections have gradients of varying, and sometimes significant, degrees. The interactive map shows where these inclines are located.